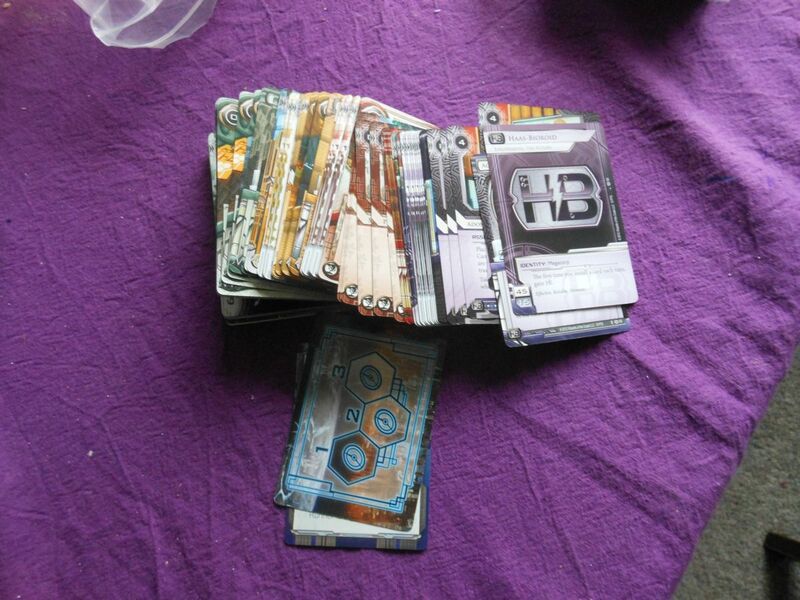 Finally gotten around to playing a few games of Netrunner. The one thing that really sticks out, is the fact that unlike every other game I can think of, both sides play differently. Take Magic for example, you both build decks and play the cards based on cost of that card and then play cards to attack your player, that’s nothing like Netrunner. 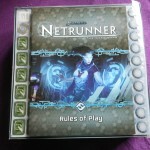 Netrunner has two players, the Corporation and the Runner. 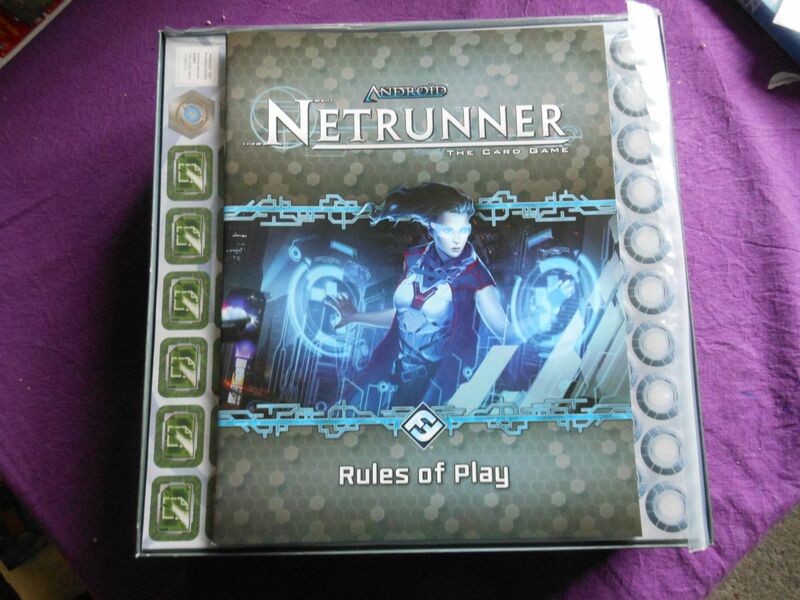 The runners aim is to steal Agendas from the Corporation and the Corporations idea is to ‘Flatline’ the runner (kill/stop them) or complete a number of Agendas. 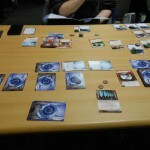 So the Corporation player is always on the defensive and then Runner on the offensive. Of course there are cards that can be deemed offensive for a Corp player and likewise a Runner can play cards that protect themselves or counter Corporation cards. Anyway I’m running off here, let’s go back to basics. When you start the game you first build a deck. 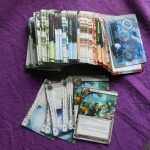 It would appear that you want as few cards as you can so to make sure that you’ve always got good cards in your hand, however the downside to this is that the Corporation player ‘looses’ if they run out of cards (they must add one from the deck into their hand each turn) and the Runner must play with what’s in their hand when they likewise run out. So the Corporation can’t sit back and wait for the Runner to run out of steam, they need to complete Agendas if they can’t defeat the Runner. 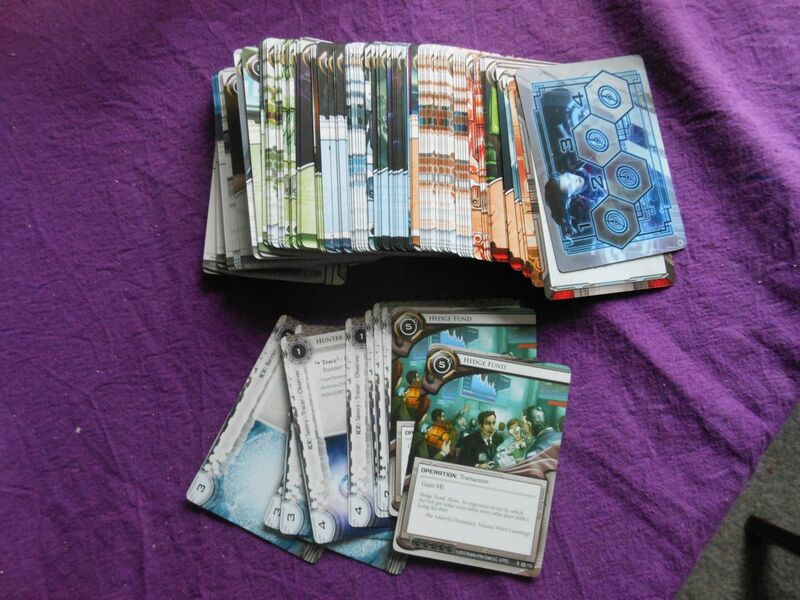 Within the core set (available here ) you get 248 playable cards, of which 3 are Runners (one Criminal, one Anarchy and one Shaper) and 4 Corporations (Jinteki, NBN, Hass-Bioroid and Weylend Consortium). Each runner plays in a different way and that’s true with the Corporations as well. 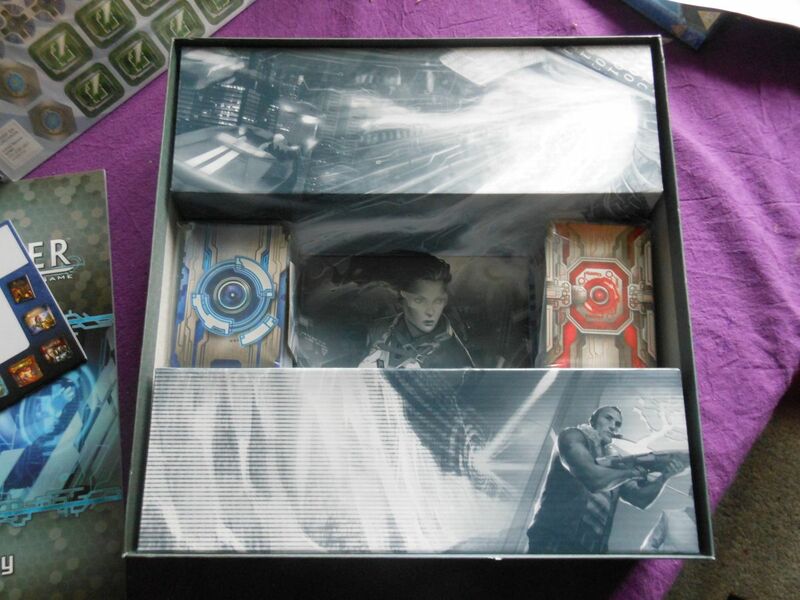 I’ve played the Jinteki deck and it took a game to understand the deck from the Core Box so next time its time to use another Corporation or a Runner. Like I said though at the start, both sides play in different ways and within each side the Runners and Corporations play different. 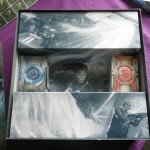 So with just the Core Box cards you can play a lot of times. When we played the first game we got the ‘Startup’ wrong. 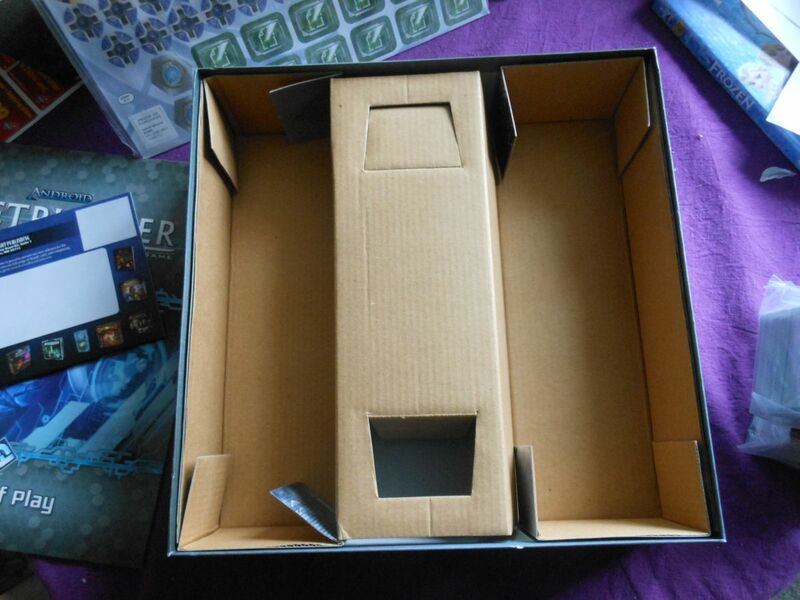 This was because even though I’d read through the Rulebook, I forgot about the start and couldn’t find it when we did start (it’s on Page 2 I think but most of the rules are much later). So the next day I re-watched the video that I linked before and then made sure I know how to start the game. Even though we got the start-up wrong, we did play the rest correctly (we did make a few issues but we sorted them out when playing) and so only a few games later and we’re good to go. 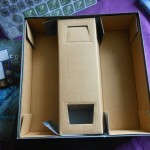 These pictures were taken during our first test game. I won the game because I installed a damaging card into a Remote Server and lured the Runner to have a run at that Server and BAMN! 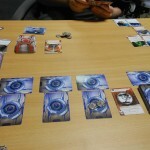 It did enough damage to Flatline him and the Corporation win the game…. What we learned from our first game was for a Runner to make sure they can keep a few cards in their hand (these cards absorb damage done) and to try and make sure they install a card to offer them some protection from damage if possible within their deck. From the Corps point of view we learned that you need a poker face but also need to be careful so that any Agenda you want to protect (and your R&D/Archive Deck) are well protected. Credit is king, so try and get as many Credits as you can to help pay for all that ICE. So what’s a Remote Server, an Agenda and R&D/Archive Decks and what the hell is ICE (not the kind you drop into drinks). Very simply this post is beyond trying to teach you all that. 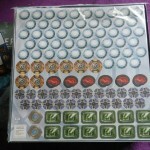 I suggest you view my last post with the Video in it or better still, go out and buy it and play it to learn the rules, however I’ll summarise stuff. Corps want to protect Agenda’s, to do this they create Remote Servers, install an Agenda and then protect that Agenda with ICE (think of this as a firewall etc). The Runner then makes a ‘Run’ against a Server and if they bypass the ICE (by using Cards installed within their Deck, or by Event based) they get to see what’s installed at the Server and if it’s an Agenda they get to steal it. Now to also help the Corporation, they can install Assets which the Runner won’t know is just an Asset until they make a run and reveal it. 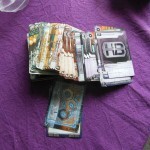 Some Assets help the Corporation for example by giving them a credit boost each turn, or may in fact hurt the Runner (see the Cards above in my pictures). The R&D Server is the ‘cards available’ that you pull cards from, and the Archive Server is where any cards used/trashed go. Runners can make runs on these servers and if they reveal Agenda cards here they get to steal them. Lastly to complete an Agenda for a Corporation, they need to ‘Advance’ that Agenda. This costs your actions for a turn and a credit. 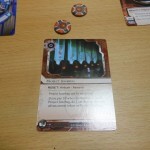 Runners please note, you can also advance Asset cards… once an Agenda is fully advanced (its met its requirements) then the Corporation can ‘Score’ it, and if they have 7 Agenda score or more they win. Phew! Sounds tricky but it’s not that complicated. We’re still learning but have all the basics down and I’ve very much enjoying playing it. 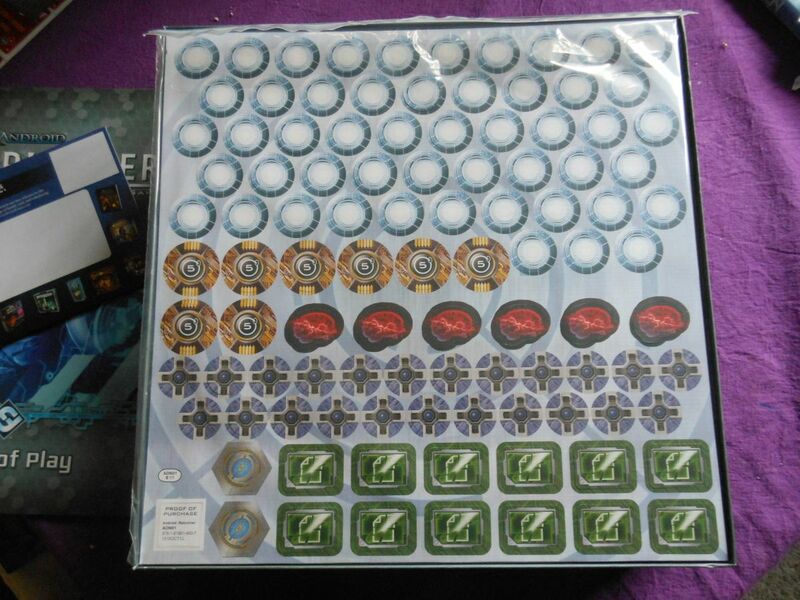 I’ve also started to look into storage for my growing collection of cards and started to look for Playmats (similar to those used in official competition) more on those in a future post.